"Will leave fantasy and science-fiction fans asking for the next installment. Bring it on!" The Columbia Review. 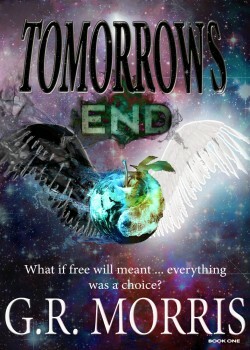 “Tomorrow’s End” by G.R. Morris (Dark Light Publishing) is book one in “The Path of a Savior” original science fiction / fantasy series. With an original plot line and credible lead character, “Tomorrow’s End” shows great promise. The story, like much of today’s society in the contemporary world in which we live, has strong spiritual and faith-based motifs. It opens with a convincing quote: “And I saw another savier fly in the midst of our fallen brethren, to bring unto them death to all that dwell beyond the earth.” With this fictional prophecy, the author begins (and maintains) a credible voice that enables the reader to suspend belief and enjoy the action. Mr. Morris keeps us in suspense throughout the journey with intense dialogue and hair-raising action, while the main hero, a 16-year-old boy, goes on a an adventure that could end badly at any moment. But as with all good stories featuring a young protagonist, there is a lot of growing up while the action keeps pumping. Science-fiction lovers would enjoy the usual suspects, including unique-yet-familiar aliens, a menacing, all-powerful supercomputer with a memorable personality, and a creative set of religious beliefs that may not be so far fetched compared to what some people actually believe in these days. In summary, at its essence, “Tomorrow’s End” is an original story of pain and redemption, as the author aptly quotes Khalil Gibran: “Your pain is the breaking of the shell that encloses your understanding.” This is a solid first novel by G.R. Morris that will leave fantasy and science-fiction fans asking for the next installment. Bring it on!